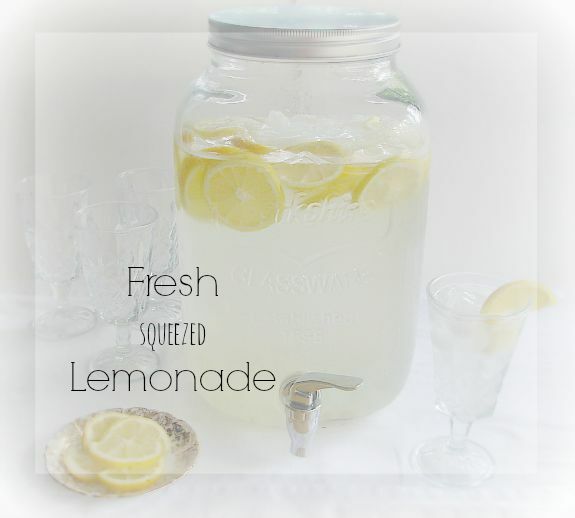 Fresh lemonade is perfect for hot summer days! If you have never tried making your own… you don’t know what you are missing. Fresh lemon juice is healthy and hydrating, mixed with ice and a little sugar for a sweet beverage. It’s not as complicated as you might think. At first, I was hesitant to post something so simple. Every time I serve this to guests it amazes me what a great response it gets. It also amazes me how so many people are impressed that it’s fresh. You can usually find a fairly inexpensive bag of lemons, sugar, and ice. You can also make a large amount to serve at a large summer gathering. This is an easy crowd pleaser and you can add as much or as little sugar as you want. You can even omit sugar and serve healthy lemon water. I use this recipe a lot since it is such a simple and inexpensive way to serve a lot of people, I’ve never had any complaints! Dissolve sugar in a large cup of hot water. Slice lemons in half and squeeze them into a large 2 quart pitcher using a citrus press. You can also simply squeeze with your hands or use a handheld citrus squeezer. Add dissolved sugar water to lemon juice and stir. Add Ice and water, stir well and serve. This is so simple, you can add as much sugar and lemon juice as you wish. Once you try lemonade with freshly squeezed lemons it will be hard to go back to a powder or mix. With lots of long hot summer days left there’s still plenty of time to impress your friends, family….and yourself!